Congrats Greg & Hannah! | The Evelo Team : Fishers, Noblesville, Carmel & Indianapolis area REALTORS. Congratulations to newlyweds, Greg and Hannah as they closed on their first home today! was on hand to help guide Greg and Hannah through the home buying process as they purchased a great first home in Carmel, Indiana. Buying your first home together is a great way to start life as newlyweds. Smart investment, strong futures and a solid foundation. 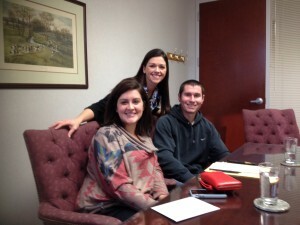 Congrats to all on a great closing and to the next steps in your lived together! What Is a Day in the Life of a REALTOR Really Like? Is Buying Your First Home Within Your Grasp?